You have just discovered a hidden jewel – the Conewango Creek in North West Pennsylvania!! The Conewango Creek has been named as Pennsylvania’s 2015 River of the Year! My family and I have lived on the banks of the Conewango for many years, and we are pleased to have the opportunity to share this wonderful waterway with you. From superb smallmouth bass, pike and trout fishing to bird watching, sightseeing or just relaxing with old friends or making new ones, the Conewango has something to offer everyone. We are a family run business and are happy to help you plan out a safe, fun, and memorable trip from start to finish. 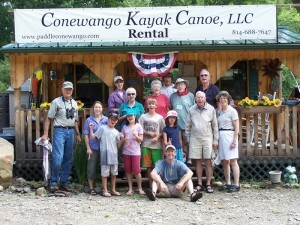 We take stewardship of the Conewango very seriously and ask that you please do the same. Free trash bags are available. At the end of your trip, we will refund a portion of your trip cost for each full bag of litter brought back to the livery – even your own trash! We have added to our fleet, while keeping comfort in mind we have stayed with Mad River Canoes. The new canoes are like our other canoes with built in drink holders, molded seats and adjustable back rest. Our canoes will seat 3 adults. Enjoy a family outing in comfort! Conewango Creek Named 2015 PA River of the Year! © 2019 Conewango Kayak Canoe Rentals, LLC, all rights reserved.